“Capitalizing on two unrelated exercises conducted nearby in mid-September, SPY-6(V) not only tracked multiple threats simultaneously but also a ballistic missile – through intercept, for the first time,” Raytheon’s statement noted. The U.S. Missile Defense Agency (MDA) did not release a statement on the testing, suggesting that the AN/SPY-6(V) was likely not involved in enabling a ballistic missile interception itself. Raytheon did not clarify which exact intercept tests the SPY-6 was involved in tracking, but the reference to tracking through intercept suggests at least one may have been the recent U.S.-Japan test of an upgraded SM-3 Block IB interceptor off Hawaii in September. That test resulted in a successful interception. The test marked a first in the development of the AN/SPY-6(V), which is a generational improvement over existing ballistic missile tracking radars, including the AN/SPY-1D(V), along several measures, including range and sensitivity. 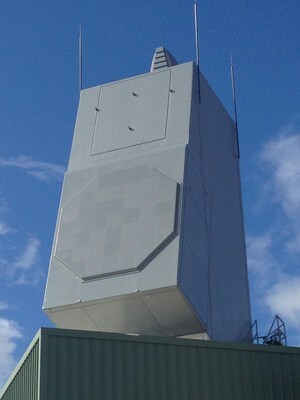 The AN/SPY-6 is designed as an integrated air and missile defense (IAMD) radar. With one physical face, it is built to detect threats at a long range using active electronically scanned array (AESA) antennas. “AN/SPY-6(V) continues to impress through consistent performance against complex, surrogate threats,” said U.S. Navy Captain Seiko Okano, the Major Program Manager for Above Water Sensors at the Program Executive Office for Integrated Warfare Systems. The AN/SPY-6 unit used in the test was likely the same one delivered in 2016 to the U.S. Navy’s Pacific Missile Range Facility. That unit was delivered and installed in June 2016 after undergoing preliminary testing in Massachusetts. The AN/SPY-6 is expected to undergo further development and testing, with plans to eventually integrate it as the next-generation radar for Aegis ballistic missile defense (BMD) on U.S. Navy guided missile destroyers. The radar will work with the Standard Missile-3 (SM-3) Block IA/IB and Block IIA when deployed as well as the Standard Missile-6 (SM-6). The U.S. Missile Defense Agency conducted its second successful SM-3 BlockIIA intercept test in 2018.